More and more businesses are creating videos and seeing the value. Videos are a great way to demonstrate a product, detail a service, or introduce people to your staff. Videos can be time consuming to create, and expensive to make. While we have observed a growth in the number of businesses making videos, the majority of them fail to think about the next step: How do you get customers to see it? We see the video process as having two parts: Production & Distribution. Production is the planning, shooting and editing of the video. Distribution is taking the finished video and putting it in front of people. While there has been a great increase in attention paid to the production, distribution is something many forget to focus on. Where Are You Putting Your Finished Videos? So where do your videos go? How do you get them seen? How do you measure the success of a video you’ve made? These are all questions you should ask yourself. We’ve found that many business owners take a “Field of Dreams” approach to video distribution. The famous quote from the movie, “If you build it they will come”. If you build a great video and throw it on YouTube, you will soon find that your intended audience will not find it automatically. It’s similar to printing fliers. Just because you’ve printed 100 fliers and have them stacked in a box, doesn’t mean people will seem them. You have to do the work to get those 100 fliers into 100 prime locations to reach your desired audience. Video works in much the same way. Even though you aren’t passing out physical videos, you do have to think about how to place them in front of people you want to see them. Youtube, your website, community pages etc. are all places you can start. We have found a primary space for these videos should be on TV in your business location(s). This doesn’t have to be your TV solution. Having your videos on TV will draw more attention to them. It will get them seen by customers that are more likely to act upon your messaging. There are many ways you can get your videos onto TVs in your locations. We have details the top methods in this article: 3 Ways to put your videos on TV. The problem with most display solutions is that they loop. Unless you have a large library of content at the ready, people are going to watch the same thing again and again with no break and nothing new. Maintenance and upkeep are also issues – often needing to brave a utility closet full of wires, re-load physical drives or USB sticks, or having to hire a specialist in order to update or fix what’s on the TV. Putting an easy-to-use system in place that will play your videos and mix them with other TV programming is key. It’s Relevant TV takes the majority of the work away- providing your business with relevant TV programming, and a way to make the most out of your media. It’s Relevant is a cable alternative that provides businesses a TV solution in the form of a living network of short-form content. IRTV’s library of videos is broken up into categories for you to choose from based on your customer’s interests, and gives you full control over what’s on your TV. The service provides compliments to your own videos as well as complete management of one or multiple TVs. IRTV tracks everything so you can know how many times each of your videos were displayed, along with specific timing and location. The big difference between It’s Relevant TV and other solutions is in the content. IRTV provides interesting and entertaining content while inserting your own messages and real-time social media for people to see while engaged. 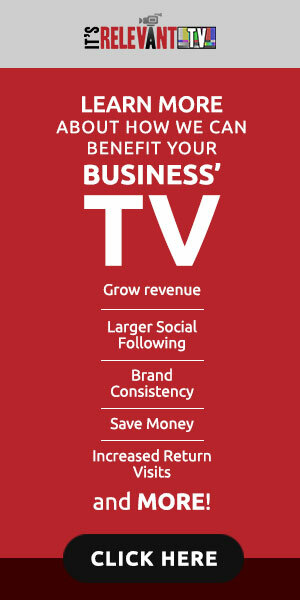 Visit itsrelevant.com to learn more about the easy-to-use and cost effective TV solution.